Work over winter, in between exhibitions, mainly concentrated on layout maintenance with some detailing thrown in for good measure. Speed boards and mile posts were bought from Uneek; the speed boards are only for a single speed sign so other boards for the second speed were scratchbuilt from styrene and glued onto the posts. These were painted white and yellow, had number decals applied, then were glued trackside in positions corresponding with the prototype locations. Speed boards for the Up (left) and Down (right) main lines added to the corner module where the Mudgee branch meets the main. 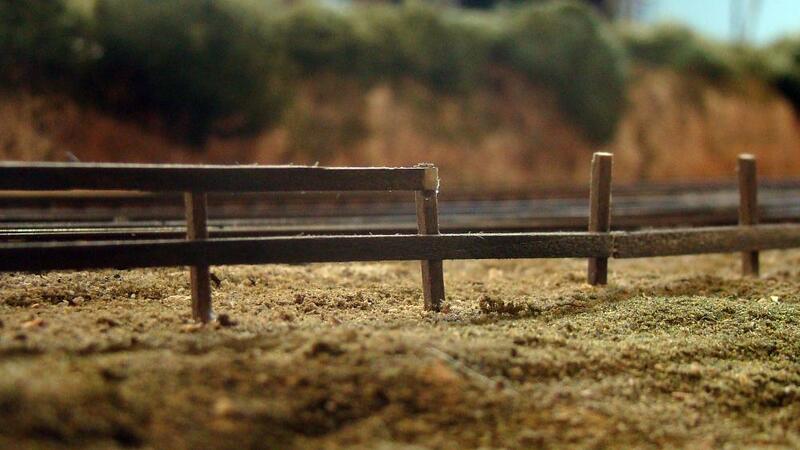 To keep the horses at bay, a two-rail wooden fence is being erected alongside the main line. Using a standard fencing distance as a reference, the locations for the posts were marked out to scale, the holes drilled, and the posts installed using white glue. The rails were then cut to length, stained, and glued to the posts. Clothes pegs were used to hold the rails to the posts while the white glue dried. The two-rail horse fence under construction. The bottom rail has been completed, the clothes pegs clamping the pieces together have just been removed, and work is about to continue on the top rail. 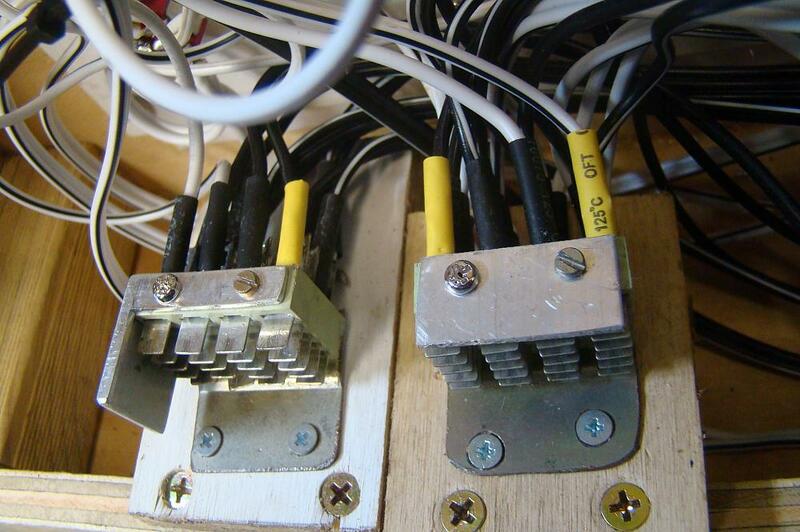 A standard jumper cable plug on the left, a plug for an extra connection between modules on the right. The shapes of the aluminium pieces on the plugs and sockets makes it impossible for one kind of jumper cable to be plugged into the other kind of receptacle. 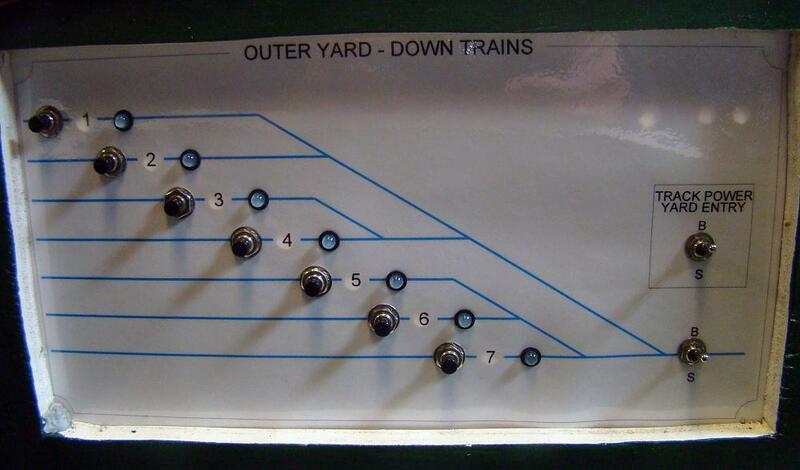 The control panel for the Down yard was updated, the schematic being replaced with one showing the new track arrangement. The schematic was designed in a CAD program and constructed in the same way as described in the June 2009 update. LEDs were inserted into the panel, an LED control circuit board was fabricated and installed, with the inputs wired into the existing diode matrix point motor control system. The new Down Yard control panel. Whenever a storage track is chosen by pressing the pushbutton, the points and track power are routed for that track and the corresponding LED only will be lit.